The Aishihik hydro plant, located about 110 kilometres northwest of Whitehorse, has provided renewable electricity to Yukoners since 1975. It was built to serve the growing electrical demands of Yukoners and of a large lead-zinc mine at Faro in the Central Yukon. The original plant included two hydro units that could each produce up to 15 megawatts of renewable power. In 2011, a seven-megawatt hydro generator was added. The Aishihik facility is located a remarkable 110 metres underground. It is the first underground power plant north of the 60th parallel in the western world. The original plant included two hydro units that could each produce up to 15 megawatts of renewable power. In 2011, a seven-megawatt hydro generator was added. The facility can now produce enough power to supply about 12,500 non-electrically heated homes. Aishihik annual produces about 25 percent of the total energy generated by Yukon Energy. The Aishihik plant is extremely important to Yukon Energy’s operations. Although the 40-megawatt Whitehorse Rapids hydro facility is larger than Aishihik, the effective capacity of the Whitehorse plant is reduced by close to half during the coldest months of the year because of reduced water flow on the Yukon River. 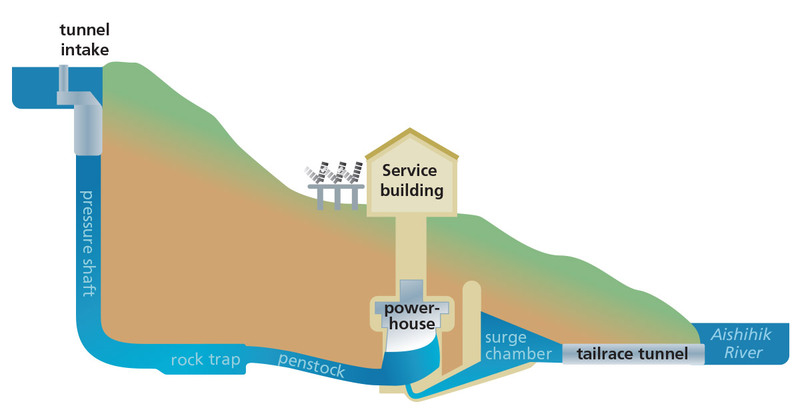 Aishihik is the only hydroelectric facility in Yukon that can store energy in the summer when demand is low, to be used in the winter when demand is high. It can also store energy during wet years, to be used in dry years when the levels of the lake water are lower.